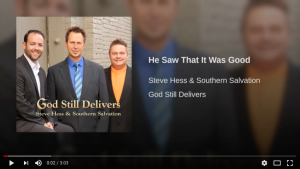 Information: "He Saw That Is Was Good" is from the album 'God Still Delivers' by Steve Hess & Southern Salvation. This new release features Steve Hess himself. With a number of Singing News chart singles from their last album, including a Singing News Top 40, listeners will enjoy this uptempo, fun radio release.